For each directed edge A -> B in graph, A must before B in the order list. 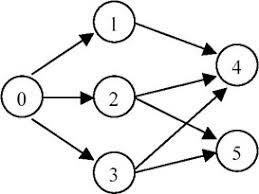 The first node in the order can be any node in the graph with no nodes direct to it. Find any topological order for the given graph. You can assume that there is at least one topological order in the graph. Can you do it in both BFS and DFS? * @return: Any topological order for the given graph. 首先获得节点的入度数，时间复杂度为 O(V+E)O(V+E)O(V+E), 使用了哈希表存储，空间复杂度为 O(V)O(V)O(V). 遍历图求得入度为0的节点，时间复杂度为 O(V)O(V)O(V). 仅在入度为0时调用 DFS，故时间复杂度为 O(V+E)O(V+E)O(V+E). 综上，时间复杂度近似为 O(V+E)O(V+E)O(V+E), 空间复杂度为 O(V)O(V)O(V). 同题解1 的分析，时间复杂度为 O(V+E)O(V+E)O(V+E), 空间复杂度为 O(V)O(V)O(V). 同题解1 的分析，遍历所有节点所有边，时间复杂度为 O(V+E)O(V+E)O(V+E), 空间复杂度为 O(V)O(V)O(V).